Degreasers, or mesh prep chemicals create a smoother base while allowing for easier application of film. They are used before applying capillary film, and can effectively reduce streaks. BIOScreen BIODegrease is an economical general purpose degreaser ideal for all mesh types. BIOWet is a premium screen degreaser specially developed for use with projection systems, liquid emulsions and capillary films. ChromaClean is a mesh degreaser that removes oily residues that interfere with mesh adhesion. Degreasing with ChromaClean prevents premature breakdown caused by contaminants such as skin oil. ChromaWet allows uniform sheeting of water on the mesh surface, yielding uniform film adhesion while preventing dry spots that cause weak, “blistered” spots. FOTECHEM 2034 is a ready-to-use abrader, mesh prep and degreaser. It is recommended for use on new screens in order to improve stencil adhesion. It is recommended for use with both direct emulsion and capillary film. FOTECHEM 2034 is particularly recommended to improve exposure latitude and adhesion of photopolymer stencils. Degreaser 260 is a multipurpose, concentrated citrus product that does the job of 3 products. This non-abrasive, water-based formula degreases new and used mesh and removes unwanted residue. As a nonflammable ink degrader, it emulsifies inks for easy water removal before reclaiming. Finally, it is a safe, non-caustic screen dehazer that will not deteriorate the mesh and will not burn skin or clothing. It is freeze & thaw stable. 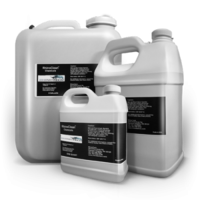 Reclaimer 660 is a high quality, ready-to-use stencil remover that quickly breaks down emulsion and capillary films. For safe handling, it requires no mixing, and its unique packaging offers easy-to-use, labeled sprayers in combination with the 5 gallon refilling station. Reclaimer 660 is non-corrosive and safe for shipping. It is freeze & thaw stable. DG 2200 is a biodegradable degreaser. It is a non-abrasive fabric treatment that acts like a wetting agent for use on all synthetic and wire screen mesh. DG 2200 provides an even sheeting of water for complete uniform stencil adhesion. DG 2200C is a biodegradable gel degreaser. It is a non-abrasive fabric treatment that acts like a wetting agent for use on all synthetic and wire screen mesh. DG 2200 provides an even sheeting of water for complete uniform stencil adhesion. Due to its thixotropic character, it is a very effective preparation product for large format screens held in a vertical position. SP 2255 is an abrasive mesh pre-treatment containing microscopic grit and a degreasing wetting agent. It is designed to make monofilament fabric more receptive to stencil adhesion. SP 2255 works quickly to lightly abrade and degrease without clogging the mesh openings, and it can be used before each screen preparation.